ArchitectureWeek No. 535 is now available on the Web, with these new design and building features, and more. For the second year in a row, the top British architecture prize has been awarded to a building designed by Zaha Hadid. The Evelyn Grace Academy in the south London district of Brixton has received the Stirling Prize for 2011 from the Royal Institute of British Architects (RIBA). Like her 2010 Stirling Prize winner — MAXXI, the Museo Nazionale delle Arti del XXI Secolo, in Rome, Italy — Evelyn Grace Academy is a bold, sinuous building — an expression of Hadid's flamboyant style. Both structures occupy infill lots, adjacent to historic buildings, in gritty residential neighborhoods. Unlike MAXXI, which embraces the fabric of its neighborhood quite literally by engulfing an existing building on its site, Evelyn Grace Academy stands apart from its surroundings. 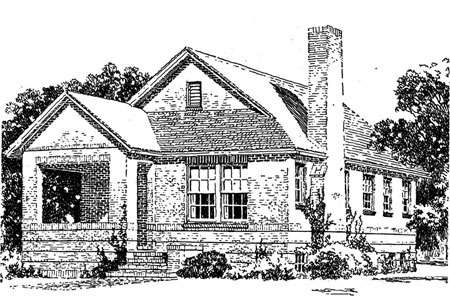 The school itself is set well back from the surrounding streets, its four-story glass-and-aluminum-clad form rising above the mainly two-story brick buildings nearby. A tall fence — solid concrete in some areas, steel mesh in others — encloses the school site, isolating even its open spaces from the street. 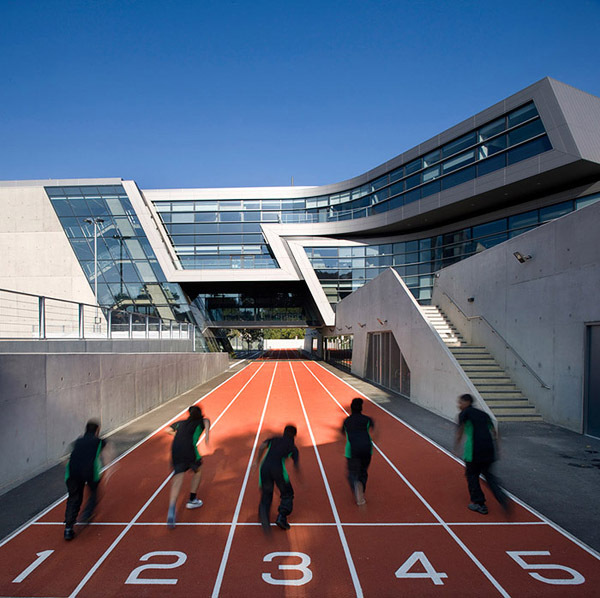 Although glass dominates the academy's facades, the viewer's eye is naturally drawn toward the sharply angling metal borders that divide the facade, producing a sense of urgency and motion that seems to hint at the school's sports focus. 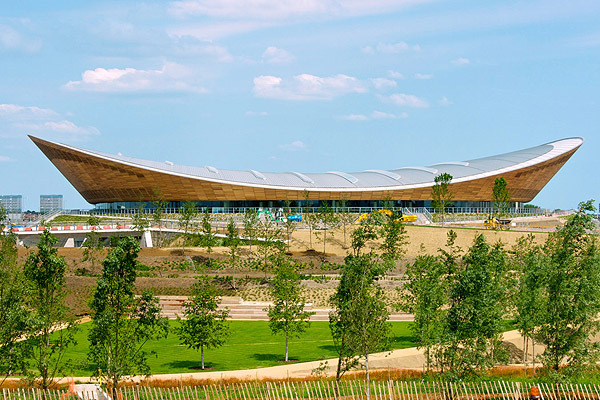 The Velodrome is one of four permanent venues at London's Olympic Park. Designed to host indoor cycling events for the 2012 Summer Olympic and Paralympic Games, the venue will also provide continuing public functions after the games, with minimal transformation. Deriving its form from the track itself, the sweeping building comprises three main elements: the roof, the concourse, and the plinth. The glazed concourse separates the curve of the wood-clad roof soffit from the concrete and landscaping of the plinth. Internally the material palette is carefully controlled; fine cast-in-place concrete abounds. 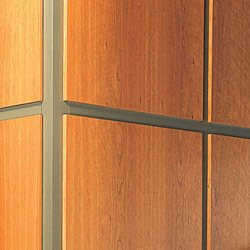 The material and visual emphasis is on the beauty and color of the timber track. The arena is surprisingly intimate for a 6,000-seat venue, with the cable-net roof sitting low over the bowl. No seat is very far from the track. The building is a consummate exercise in a simple idea beautifully and efficiently carried out. A bedrock belief in the classic theology of modern architecture was that architects always had to be original. Architects were to create a new built world that divested itself from the past, from classical architecture and its decoration, and invent brand-new, innovative buildings. In many ways, for a modern architectural designer, being original could be more important than being good. 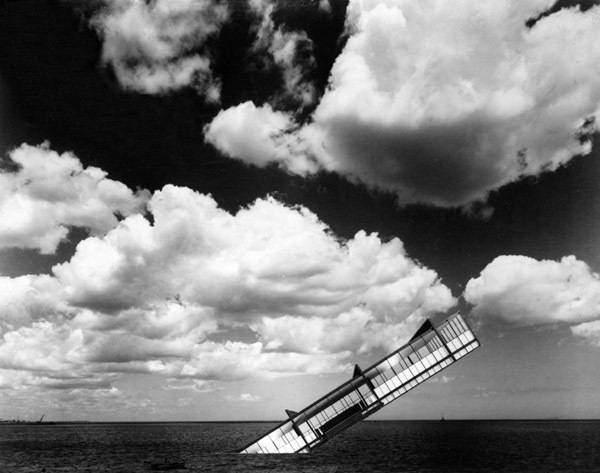 A refreshing reminder that this does not necessarily have to be the case is the exhibit of the work of architect Stanley Tigerman currently on display at the Yale School of Architecture's Paul Rudolph Hall. Tigerman began his university education by flunking out of MIT. He studied for a while at the Illinois Institute of Technology (IIT) Institute of Design in Chicago. It wasn't until after he had served four years in the Navy, and worked for several years as an architectural draftsman and designer, that he came around to studying architecture at Yale, earning a bachelor's degree there in 1960 and a master's in 1961. This was just about the time that things started going badly for modern architecture. Modern rhetoric was tired, and architectural theorists such as Robert Venturi started to explore what kind of architecture might come after modernism. Help build ArchitectureWeek and Great Buildings with your support! It's fast, easy, private, and secure. Download a general guide from the Marble Institute of America for tradespeople on the practice of mechanically anchoring dimension stone, offering insight about how stone-anchorage devices interface with stone panels and the building structure. The bulletin also discusses common anchorage devices and gives guidance on appropriate anchor devices in different situations. Kane Manufacturing Corporation introduces Eco Screen by Kane, a living-wall system that fastens to outdoor structural walls using steel wire panels. The screen allows plants to grow freely without the worry of aggressive vegetation anchoring itself to building materials. Each panel consists of two galvannealed steel jamb channels, two face grids of 10-gauge galvanized-steel wire in a 3-by-3-inch (7.6-by-7.6-centimeter) grid pattern, and truss supports of the same wire, all welded together to form a 3-inch-deep frame. 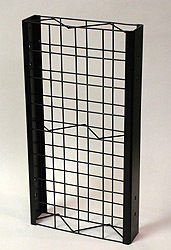 The thermoplastic polyester powder coating can withstand harsh outdoor conditions. Available in black and green, with custom colors available upon request. Recycled content. See our comprehensive new visual catalog of architectural products, powered by DesignGuide! "Your magazine has helped me through my education with an abundance of inspiring articles and photos." A 12 in 12 roof slope is 45 degrees. What is the angle of a 24 in 12 slope? What are the rise and run of a 90-degree slope? What is the common term for high-voltage tubing (HVT)? "Here is a small house with real architectural merit. The fine chimney, the roof, the gabled porch, the proportion of height to length and breadth, and the fenestration combine into a very pleasing whole. The large square porch forms a complete protection for the entrance, which leads directly into the ample living room. ... "
in ArchWeek? Tell the world in our DesignCommunity forums. And, as always, please talk back, to "editor@architectureweek.com"! Update your entry in the building industry's hottest wiki. Join the free email list for these weekly email Notes. Advertise in our weekly newsletters to 125,000 double-opt-in readers! Add our rotating Architecture Headlines to your own web site. Subscribe and contribute to help support ArchitectureWeek on the Web. Suggest a web site to be linked from our free Web Directory. More Newsletters by ArchitectureWeek - subscribe free! a similar readership on paper - not counting these newsletters! monthly subscriptions - and read ArchitectureWeek online! delivered 47 times a year to 400,000 monthly visitors. network with six million monthly unique visitors overall. The way of architecture... Artifice, Inc.
artificer, construction, workmanship. 2. The product of art. 3.
skill. 6. Skill in expedients. 7. An ingenious expedient." to help ensure successful delivery of these newsletters. Click Forward in your email -- Share ArchWeek Notes with a friend!